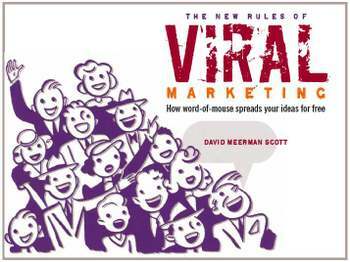 The New Rules of Viral Marketing - free ebook! > Imagine you're the head of marketing at a theme park, and you're charged with announcing a major new attraction. What would you do? > What would you do if you were a vice president of marketing for a technology company and you were ready to find a new opportunity to advance your career? > If you were a marketing executive for a big, famous company, how could you quickly put a human face on your organization? > Or think of a marketing program that you might initiate if you suddenly had to launch a startup technology and services company targeting marketing professionals, Web designers, and business owners interested in improving their Internet marketing. How would you do it? The answers will surprise you. The smart marketers profiled in The New Rules of Viral Marketing: How word-of-mouse spreads your ideas for free tell you exactly how they used viral marketing and provide advice in their own words. Download The New Rules of Viral Marketing now! It's free and there's no annoying registration requirement. You and I are incredibly lucky. For decades, the only way to spread our ideas was to buy expensive advertising or beg the media to write (or broadcast) about our products and services. But now our organizations have a tremendous opportunity to publish great content online—content that people want to consume and that they are eager to share with their friends, family, and colleagues. How word-of-mouse spreads your ideas for free! Word-of-mouse is the single most empowering tool available to marketers today. I wrote this e-book so you can take advantage of the power of viral marketing too. In it, I share ideas that will help you create your own viral marketing strategies and campaigns. These are the "new rules" I've used to create marketing programs that have sold more than a billion dollars' worth of products and services worldwide. It's not easy to harness the power of word-of-mouse, but any company with thoughtful ideas to share—and clever ways to create interest in them—can, after some careful preparation, become famous and find success on the Web. Please download my new ebook. And if you find it interesting, please share it with whomever you believe would benefit from reading it. Thank you.